Kabaddi, a fast and intense sport played between two teams, each team consisting of 7 warriors. A task for both the teams is to raid into the opponent's territory, touch them and return back to their court, as simple as it can get. The sport can only grow when it has a loyal fan base who support it in every possible way and when we see a sport like Kabaddi which is the simplest form to play any sport between two teams fail to attract people, it's quite shocking. The bigger question is, why didn't the world notice it? The sport is predominantly played in India and in South Asian countries. As India is a cricketing nation, sports other than cricket are far likely to have a structure and culture around that sport which would help the sport build a community that can keep people entertained and engaged with contents of that sport. All Indians follow cricket, similar to what European countries do with football and that is because cricket in India has a structure for it. The Indian Cricket team has been playing a good number of matches to keep its fan base entertained and keep them on the edge to know what's happening in and out of the game. Indian cricket has built a culture around itself with the icons that the country has seen, the proudest sporting moments that the team has given us and the cricketers who engage themselves with the people of the country. As an Indian or a sports enthusiast, have you ever seen a structure and culture around any other sport than Cricket? My answer is a big NO. Kabaddi is one of those sports which has all the potential to be a global sport. The sport is simple, needs almost no equipment, can be played anywhere and everywhere and is intense. If the sport could get a proper structure from the Kabaddi Federation of India by conducting matches on a regular basis and making people aware of it with the help of social media platforms, the sport could go a long way. There are a lot of Kabaddi enthusiasts who are willing to be Professional Kabaddi Athletes but what is holding them back is the sports structure right now. 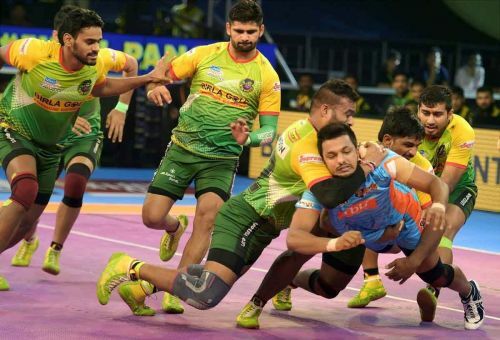 The introduction of the Pro-Kabaddi league in 2014, the league which was introduced with the influence of IPL (Indian Premier League) model was looking for a similar success and it had a success that no one expected with record viewership of 435 million viewers for the inaugural season. With a population of 1.2 billion and the popularity of the sport in tier 2 and tier 3 cities were the key factors for its success. This was a sign or an implication for the federation to conduct Kabaddi events in towns and villages on a regular basis and to bring in new talents to the sport which can help Kabaddi grow to a new level. With the introduction of the Pro-Kabaddi league, there have been so many stars that have risen to the popularity with the likes of Anup Kumar, Pradeep Narwal, Manjeet Chillar, Kashiling Adake and many more. If the sport has achieved such great success in its initial days and is still tasting the success here in India then make no mistake, the sport is going to be global if there is a proper structure to it. If we look at what's happening with Kabaddi at a global stage, it is depressing. The way the International Kabaddi Federation is conducting the Kabaddi World Cup is not very convincing if you see the stats. The first ever Kabaddi World Cup was held in 2004 which India won against Iran and next one was in 2007 which was a similar scenario where Iran lost to India. The interesting part to be noticed here is the third World Cup which took place after a gap of 9 years, i.e. in 2016 which again had India and Iran competing for the title where India emerged as champions and for all the World Cups the host has been India. Considering the popularity surge and the league success, the 2019 World Cup is being hosted by Dubai, which marks the first step in taking Kabaddi's success across the boundaries and to make people aware of a sport that can go global. With more and more countries being added to the World Cup list we believe that Kabaddi is gaining the traction and it is getting all the accolades that it deserves. Those days are not far away when we will see people standing in a queue to buy Kabaddi tickets.